The last decade of the twentieth century is already proving to be as dramatic as any decade before. The chances of global peace seem stronger now than at any time since 1900 and the people and organizations that have contributed most towards this progress are recognized by the Norwegian Nobel Committee. 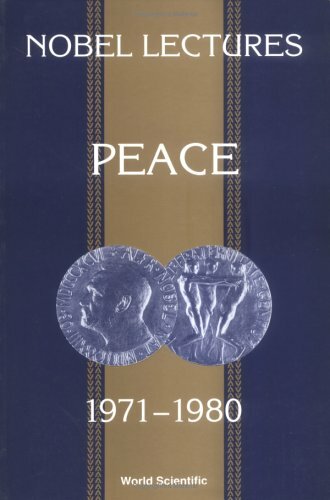 The Nobel Peace Prizewinners during the period 1971 - 1980 include men, women and organizations whose principles, dedication and diligence continue to shape history.These volumes are collections of the Nobel lectures delivered by the Prizewinners, together with their biographies, portraits and presentation speeches by representatives of the Norwegian Nobel Committee for the period 1971 - 1980. Each Nobel lecture is based on the work that won the laureate his prize. New biographical data of the laureates, since they were awarded the Nobel prize, are also included. These volumes of inspiring lectures by outstanding individuals should be on everyone's bookshelf.Below is a list of the prizewinners during the period 1971 - 1980: W Brandt, H A Kissinger, Le Duc Tho (declined), S MacBride, E Sato, A Sakharov, B Williams, M Corrigan, Amnesty International, A El Sadat, M Begin, Mother Teresa, A Pérez Esquivel. WEEK TO TEN DAYS TO THE SHIPPING TIME. .
everything, that is, WE NEVER SEE YOUR CREDIT INFORMATION. Other payment methods considered via email request.